The cover for Tank’s 1982 debut album “Filth Hounds of Hades” was probably one of the most iconic of the NWOBHM era and the album itself is recognised as a classic in the genre. Now, more than 35 years later, there are two different versions of the band. 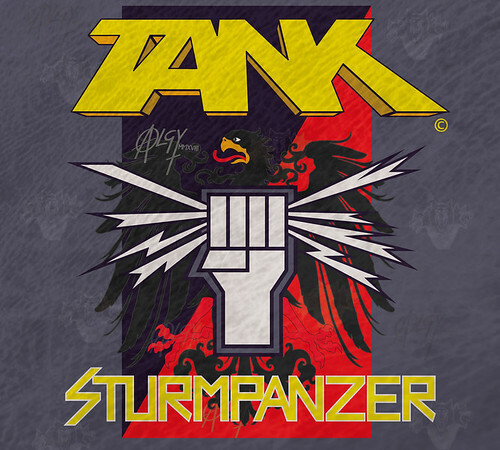 Lead singer Algy Ward’s Tank released the album “Sturmpanzer” through Dissonance Productions on 16th November. The track “No More War” was included on the Friday NI Rocks Show on 21st December. Tank was formed in 1980 by bass player and singer Algy Ward. The other two founding members were drummer Mark Brabbs and guitarist Peter Brabbs, but they departed after the third album in 1983. By that time the band had added a second guitarist, Mick Turner. Cliff Evans joined the band as guitarist in 1984 with drummer Gary Taylor arriving in 1985. That line-up remained constant then until 1989, when the band decided to call time. By then they had released five studio albums and a compilation album. Ward, Turner and Evans reformed Tank in 1997 and were joined initially on drums by Steve Hopgood and then by Bruce Bisland. In 2007, after releasing another studio album and some live albums, the band members split with two versions of Tank emerging. Guitarists Turner and Evans have now released three albums as Tank, working with a number of different singers, drummers and bass players, including vocalists Doogie White (2008-2014) and ZP Theart (2014-2017). Algy Ward’s version of Tank is essentially a one-man band as he sings and plays all of the instruments on the two albums released to date – “Breath of the Pit” in 2013 and “Sturmpanzer” in 2018. Ward has been talking about the release of “Sturmpanzer” since 2006 and at one point a release in 2015 was envisioned.